Indian cricketer Ravindra Jadeja has opted to back his wife, who recently joined BJP as opposed to his father and sister who have joined the Congress party. Cricketer Ravindra Jadeja on Monday said he supports the BJP after a family divide which saw his wife joining the saffron party, and his father and sister becoming members of the opposition Congress in Gujarat in run up to the Lok Sabha polls. On Sunday, over a month after Ravindra Jadeja’s wife, Rivaba was inducted into the BJP, the Saurashtra cricketer’s father and sister joined the Congress in the presence of party leader and Patidar quota spearhead Hardik Patel. “I support BJP,” Ravindra Jadeja, who was Monday selected in the Indian squad for the upcoming World Cup, said in a short tweet, tagging Prime Minister Narendra Modi and Rivaba Jadeja. Ravindra Jadeja’s father Anirudhsinh, and sister Nainaba, joined the Congress at an election rally in Kalavad city of Jamnagar district on Sunday. Congress candidate for the Jamnagar Lok Sabha seat, Mulu Kandoriya, was also present. Ravindra Jadeja (30) hails from Jamnagar. 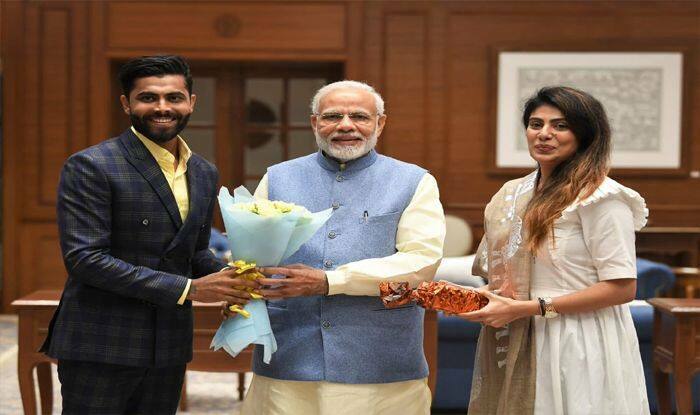 The Chennai Super Kings all-rounder’s wife, Rivaba Jadeja, had joined the Bharatiya Janata Party on March 3 in Jamnagar in the presence sitting MP Poonamben Maadam, who has been renominated by the saffron party. Voting for all the 26 Lok Sabha seats in the state will be held in a single phase on April 23.